Counting the child support paid and counting the supported children in household size is an either-or situation on the FAFSA. I am remarried and my husband pays child support for his two children that live with their mother. They pass the support test. Do we include his children in our household size as well as report the amount he pays for child support for them? If it's only one or the other, which is more financial beneficial from a FAFSA standpoint? — A.C. Counting the child support paid and counting the supported children in household size is an either-or situation on the Free Application for Federal Student Aid (FAFSA). You can do one or the other, but not both. (Be careful to distinguish between child support paid and child support received. The child support paid figure on the FAFSA will reduce total income. The child support received figure, on the other hand, is treated as untaxed income and will increase total income.) The student is always counted in household size on the student's FAFSA. The household size also includes the parent's dependent children who would be deemed to be dependent students if they were applying for financial aid. Foster children are not counted in household size. Whether other children are included in household size depends on the support test, not residence. If and only if a child will receive more than half of his or her support from the student's parents during the award year, the child should be counted in household size. The child does not need to live in the home to be counted. The support test rule is intended to address divorced or separated parents who support a child who does not live with them. Note that the support test is not necessarily restricted to just the amounts reported as child support paid on the FAFSA. Only child support paid or received because of a legal child support agreement is reported in response to the corresponding child support questions on the FAFSA. Additional amounts paid beyond the amount required by the child support agreement are not included in these figures but may nevertheless factor into the support test. Also, government benefits received by the parent in the child's name, such as TANF, SNAP, Social Security benefits, the earned income tax credit and additional child tax credits, count as part of the parent's support of the child. If a child is counted in household size on a student's FAFSA, then any child support payments made for the benefit of the child by the student's parents are not reported on the FAFSA. The child support payments may be reported only if the child fails the support test. The FAFSA instructions are quite clear, telling applicants to not report child support for children in their parents' household. The federal need analysis formula bases the income-protection allowance (IPA) on the household size. The IPA is subtracted from income, as is the child support paid, so counting a child in household size and counting the child support paid on behalf of the child would effectively be double-counting the support. Generally when a parent pays a substantial amount of child support, it is more beneficial to report the child support payments and to not include the children in household size. It all depends on whether the child support payments per child exceed the increase in the IPA for an additional child in the household size. However, if a child who receives child support (including college support) is enrolled in college, it may be more beneficial to count the child in household size. Only children who are included in household size can be counted in the number in college on the FAFSA. The parent contribution portion of the expected family contribution is divided roughly by the number of children in college. This can have a big impact on eligibility for need-based aid, sometimes greater than the impact of counting the child support payments. To determine which approach is more beneficial, use a need analysis calculator like the one on the FinAid web site to explore both scenarios and see which yields the lower EFC. Often there is little choice in whether a child is counted in household size or not. The parents either provided more than half support or did not. If the FAFSA is selected for verification, the verification worksheet will ask questions about child support paid to confirm whether the family was entitled to count the child in household size or not. Note that college financial aid administrators are likely to question situations in which the amount of child support paid is inconsistent with the inclusion or exclusion of the child in household size. 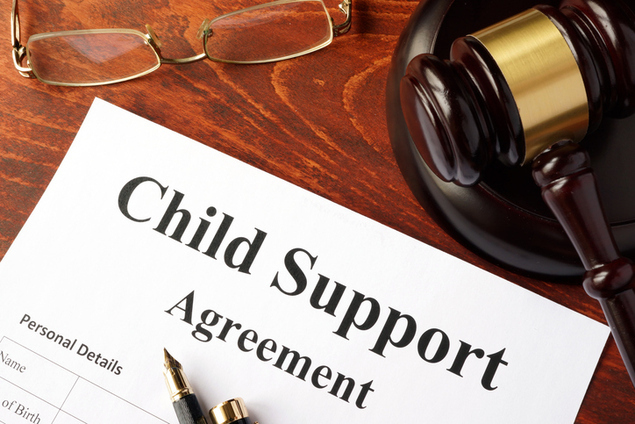 The financial aid administrator can ask for documentation relating to child support payments, including a copy of the divorce decree or separation agreement, a copy of the child support agreement and proof of the amount of child support paid.